Can dogs eat oranges? On the face of it one would imagine dogs disliking the strong citrus taste of oranges and therefore choose not to eat it even if it were part of a dog food diet. The fact is however, many dogs do like munching into a succulent slice of orange and the good news is, oranges are completely safe for dogs to eat. That doesn’t mean there are not any caveats however. Moderation is key if you wish to avoid a citrus-based tummy ache; the orange peel is also off limits, the reason for which we explain below. First, let’s take a look to see if there are any benefits of a dog eating oranges as part of their dog food diet. Can dogs eat oranges – Any Benefits? We all know that oranges are crammed packed with vitamin C, an essential vitamin for us humans. And while there are some health benefits to dogs eating oranges (and therefore obtaining additional vitamin C), it is not to the same degree as us. The fact is, dogs are able to produce their own vitamin C, meaning it does not need to be an ingredient within their dog food. You may see vitamin C added, however this is for its preserving qualities rather than nutritional value. For many, this makes the idea of feeding dogs oranges a slightly mute point form a health perspective. Oranges can be a tasty dog treat and nothing more. However, others argue that the extra vitamin C does have significant health benefits for dogs, particularly canines that are aging, sick or stressed. Clinical observations have detected that when dogs are sick or stressed, they can rapidly deplete their bodies’ output of vitamin C.
Other research has found the blood levels of vitamin C can also be extremely low in dogs with fevers and dogs that have exercised to their limits. 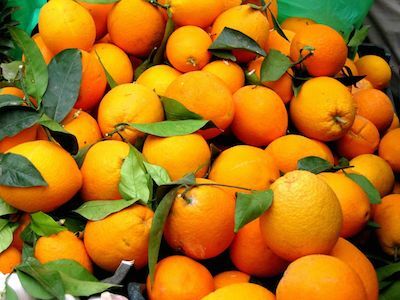 Therefore, for those that accept these findings, oranges can clearly be very a beneficial addition towards a healthy dog food diet, as they can help dogs restore their body’s vitamin C count to normal levels. Additionally, studies have found that dogs that are supplemented with vitamin C show greater resistance to disease, and a better ability to recover from injuries or illness. For a comprehensive article on vitamin C for dogs head here. As we have already mentioned, vitamin C should be fed in moderation as too much citrus in a dog’s diet can cause stomach upset. The citrus acid contained within orange juice would affect a dog’s digestive system if given in too higher a dosage. A recommended amount would be just a few slices in any one sitting. A whole orange would be too considered too much, especially for a smaller dog. (A larger dog may well be able to eat a whole orange without complaint). Furthermore, it is important that you remove the orange peel first. Orange rind is packed with citrus oils and this concentrated citrus would again upset your dog’s digestive system. The fact is, orange seeds contain amygdalin, which is a type of nitriloside, of which Laetrile is derivative. Bacteria within your dog’s gut convert these compounds into cyanide, which is highly toxic to them. If your dog eats lots of seeds and shows signs of vomiting or diarrhea, weakness or even passes out – they may well have cyanide poisoning. In which case you should take your dog to the vets immediately. As with many fruits, a small amount prepared in the correct way can mean a worthwhile addition to a healthy dog food diet. If your dog is ill or stressed, it could be that their vitamin C count is depleted as a result. A little boost from a few slices of orange could really help. However, feed them too much orange or fail to remove the rind or the pips and you could very easily cause your dog to be ill, so proceed with caution.